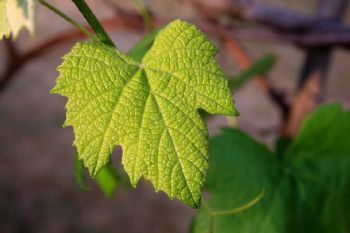 An experiment was carried out in a semi-arid area of Spain (Albacete) with the objective of quantifying the effect of different meteorological parameters on transpiration and stomatal conductance grapevine cv. Tempranillo. Measurements of evapotranspiration were taken in a weighing lysimeter during 2015. Air temperature, relative humidity, wind velocity and solar radiation were measured with an automated weather station located over a reference grass surface less than 100 m from the vineyard lysimeter. The sample frequency was 1s, and a mean value was recorded with a datalogger (CR10X, Campbell Scientific) every 15 minutes. Stomatal conductance was measured four times on some days. The result shows how evapotranspiration and conductance are affected by the different meteorological parameters.